This all-in-one weather station features clear LCD screen to display time, weather forecasting, indoor & outdoor temperature & humidity, calendar, etc. It provides two daily alarms with snooze function for you to set. In addition, it can project time and temperature on wall or ceiling for easy view. Order this versatile and helpful item now, it can help you monitor indoor environment, and check the weather much more easily before you go outside as well! Wireless Sensor Transmission: the weather station receives signal from external sensor, maximum 60m transmission distance in open area. Weather Forecasting Function: it displays in 5 weather symbols(Sunny, Slightly Cloudy, Cloudy, Rainy, Heavy Rainy, Snowy). Thermometer & Hygrometer: it displays outdoor & indoor humidity & temperature(°C/°F unit switchable) , and can display maximum/minimum value of them. Calendar & Time: time zone adjustable & time in optional 12H/24H format. Perpetual calendar up to year 2099 and it shows date, month and day. Two Daily Alarms with Snooze Function: you can set two separate daily alarms and it provides 5~60mins snooze time range or OFF for you to set. Projection Function: it projects time and temperature(indoor/outdoor temp circularly displays every 5s). The projector can be rotated about 90° forwards and backwards. Low/high brightness adjustable, two projection directions switchable. Colorful LCD with Backlight Function: 4 levels of brightness adjustable(including turn OFF). Under OFF mode, you can press "SNOOZE/LIGHT" button to light the backlight for 15 seconds. Comfort Display: indoor comfort level is calculated according to the indoor temperature and humidity, a total of 5 levels. Day of Week in 7 Languages User Selectable: English, German, Italian, French, Spanish, Dutch & Danish. Other Functions: low battery indication, outdoor DEW point temperature and heat index query, DCF radio control time function(for Germany only), mold risk display, outdoor frost alert, barometric pressure trend display. 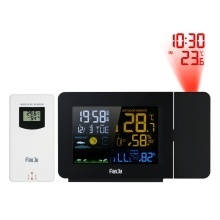 USB Operated: the weather station is operated by USB power, or you can use the EU plug AC adapter included(AC230V~240V). Easy to Operate: 7 setting keys on the top and 3 toggle buttons on the back, convenient to do all settings. 1. Please read the user manual carefully before first use. 2. The button battery is the backup power source for the weather station. When the weather station is not connected to power, the weather station&apos;s display will automatically not be displayed. 3. The weather station is arranged to be able to communicate with three external sensors. One sensor comes with the product, and the remaining two are sold separately.